Blog | Water Garden Ltd - How much does a Pond cost to build? How much does a Pond cost to build? Working out the cost of building a pond can be tricky as there are so many variables, but here at Water Garden Ltd, we thought we’d try our best to answer this very popular question! One of the wonderful characteristics of a pond is that it can be virtually any size or shape and can be used for a variety of purposes. Sizes can range from a tiny wildlife pond up to large lakes and natural swimming ponds, so let’s look at breaking down the various types and addressing the approximate costs for each. Bear in mind that this is purely for guidance as equipment and building specifications can vary quite considerably. Small wildlife pond (on a budget). Let’s assume you are prepared to do the soil digging and fitting of the liner yourself and we’ll take an example of a pond with a size of 1 metre by 1.5 metres and a depth of 0.6 metres. We always suggest a water depth of no less that 2ft (0.6m) as very shallow water will heat up quickly and result in problematic algae growth in the summer and could be affected by freezing in the winter. Once the soil is excavated and any sharp stones are removed, a 2 inch layer of sand can be placed on the pond floor. We always, always suggest a protective underlay is placed over the sand to act as a puncture resistant barrier and will safeguard the pond liner. Pond Filter (mains powered): £100 (always consult a qualified electrician if needed). Budget Total: £180 - £380. Once again, let’s assume you can excavate the soil yourself and complete the liner installation. From a filtration perspective, we’ll assume that this is purely for ornamental purposes (i.e. no fish) and for attracting local wildlife. If goldfish or small hardy fish are added, the filtration system’s capability will need to be doubled to account for the extra waste produced by the fish. The pond shape can be pretty much whatever you like, be it a kidney shape, circular or rectangular as the rubber pond liner can be pleated and folded into the excavation. We’d suggest the higher quality GreenSeal EPDM for larger ponds but PVC can be used if budget is tight. For costing purposes, we’ll go for a pond size of 3m width x 4m length x 0.6m deep. This equates to around 7,200 Litres (1,600 Gallons) so is within the limits of the larger ‘all-in-one’ pond filter from Oase. This can be submersed at the bottom of the pond, eliminating the need for hoses and installation is a relative doddle. Construction & Installation: Free (Self-build - unless you pay friends and family in beers and burgers!). Budget Total: £400 - £850. If you intend to stock your pond with fish, then the demands on the filtration system need to be thought out carefully. Fish will produce nutrient rich waste which needs to be processed or it will adversely affect the water quality and chemistry. Other factors such as location, sunlight levels and proximity to leaf-shedding trees should be taken into consideration, as with any pond build. Working on the basis of the same size pond liner as above, we can either use two of the submersible pond filters (doubling the filtration capability) or, use an external filter with an underwater pump. This will involve a flexible hose exiting the pond so the hosepipe will need to be disguised. There are also lots of choices with regards to a land based filter but let’s opt for the most popular choice of a pressurised filter as this can be buried and is easier to disguise. Budget Total: £600 - £1300. Larger Ornamental Pond (with small hardy fish). With larger ponds, there are a number of features which can be added into the design such as decorative streams, rock cascades, fountains and lighting (although many smaller ponds can feature these elements too). Costs can escalate and you need to be realistic with your available budget when creating larger features. There becomes a point where large ponds are not cost effective to filter as the equipment and the running costs are too high to consider and other technology such as floating aerators are more practical. However, a 10m x 8m x 0.8 deep pond is well within the realms of filtration and can be cost-effective to operate due to advancements in eco-technology. The costs to build a large pond can vary dramatically and it may be necessary to use a professional landscaper or waterscaper, depending on the complexity of the design. Once again, you could complete some of the works yourself to save money although excavation would probably require the hire of equipment and therefore the services of a general builder. Koi Carp are stunning fish but they will grow far bigger than goldfish or smaller hardy breeds, so the filtration needs to match their demands. Ideally, the water needs to be crystal clear for you to fully enjoy viewing these beautiful species and they will need a reasonable amount of room to swim comfortably. For this reason, we’ll assume that the pond is around 2m width, 3m length and no less than 1 metre depth. Koi ponds tend to be devoid of plants as carp tend to either disrupt plants for the fun of it or consume them! Avid Koi keepers will really go to town when it comes to filtering the water and many will install bottom drains, thermal lining, heaters and aerators but this is not always necessary. The simplest method is to use a submersible pump, leading to a land-based filter and the largest pressurised Oase filter can be matched to this pond size. We also stock a wide range of more automated filters which will keep maintenance to a minimum but (not surprisingly), these come at a greater purchase cost. Construction tends to be a poured concrete base and block work sides and are often partially raised to enhance the viewing pleasure (and can act as a seating area if desired). Usually, a Koi pond is built by a professional installer but depending on your level of building skill, you may be able to complete some or all of the works yourself and we are happy to guide you where possible. If the pond is a formal, rigid construction, then Water Garden can produce a bespoke ‘box-welded’ rubber liner which will fit exactly into the pond without the need to pleat or fold the liner. Alternatively, a single sheet of GreenSeal EPDM liner can be used. Natural swim ponds are becoming increasingly popular as they do not contain harmful chemicals and look stunning when not in use. Unsurprisingly, swimponds cannot be created on a shoestring budget and you will need a decent amount of space for the swimming area and planting (the ‘regeneration zone’). Some swimming ponds use vegetable filtration only (i.e. passing water through the planting area to help extract unwanted nutrient) but mechanical and biological extraction and UV Clarifiers can also be used either instead of, or in conjunction with planting. Pricing can vary massively depending on the specification. 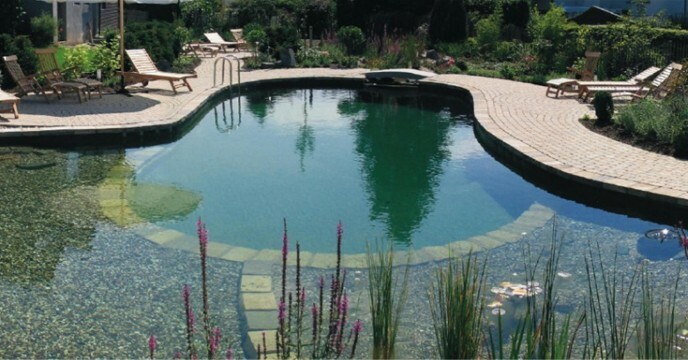 The cost for a reasonable sized informal shaped swimpond could start around £25,000 but a more realistic budget for a professionally installed swimming pond of a usable size (i.e. a 5m wide, 10m length swimming zone) would be more in the realms of £70,000 upwards. Hopefully this blog has provided you with a fair idea of what a pond will realistically cost (and we trust this has not put you off the whole idea!). Do feel free to contact us via email or phone and we can give you a full quotation for all the parts required for your pond project. We also have a network of professional landscapers across the UK who can provide you with a quotation for building works, whether you are looking for a small garden pond or a 5 acre lake!